Spontaneous end of year purchase. Echeveria Rainbow one of few variegated echeverias you will actually find for sale. Still not widely available, but you will at least be able to find this one if you look. 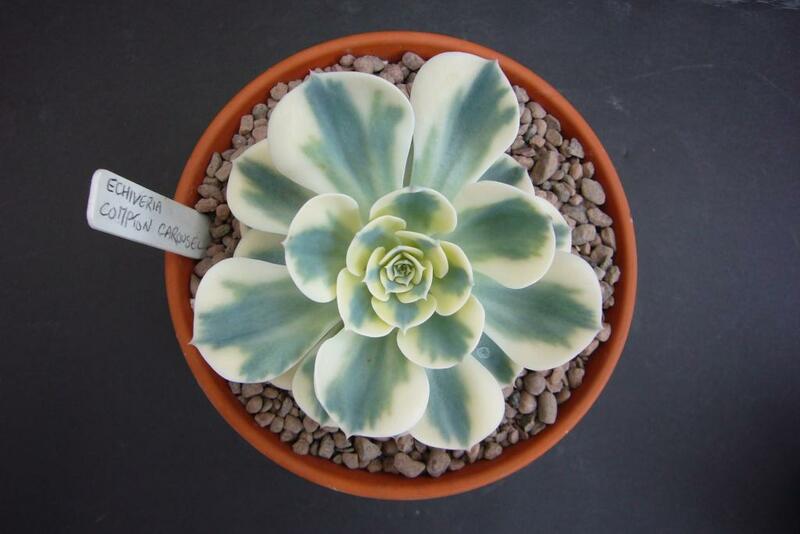 No one is exactly sure where it came from, it could be a variegated form of e. perle von nurnburg, and I can see definite similarities. A lovely little plant, although annoyingly it has a tendency to loose the lower leaves very easily, as proved when mine turned up with a few loose in the box. Normally I wouldn't buy this late in the year, but I have been after variegated echeverias for a while with little luck and when I saw this one I though why not. 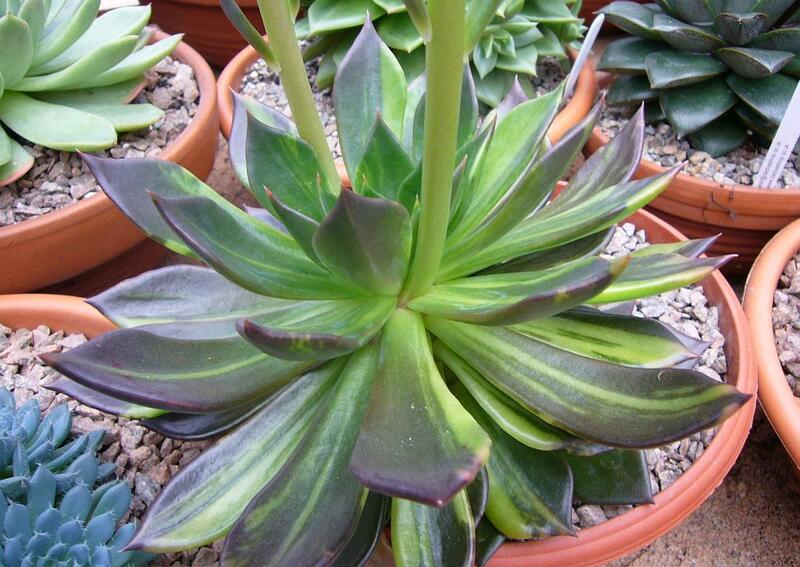 Given how easy it is to propagate echeverias I am amazed they are not more widely available. Instead there are only three that you may find readily: e. 'compton carousel', e. 'Bess Bates' and this one. There are others but these demand really high prices and you almost never find them for sale. One issue is that many are not stable, so even if you start off with a variegated plant it may not stay that way. I had it recently when a friend finally managed to get a variegated plant from leaves on his e. 'black river' (another e. black prince variegate). 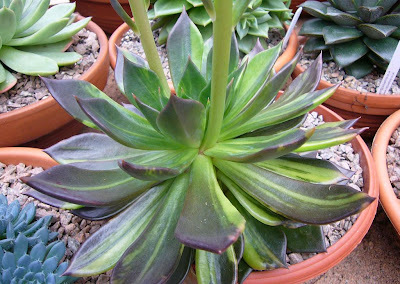 Within a few months the plant had reverted to normal, much to my frustration. 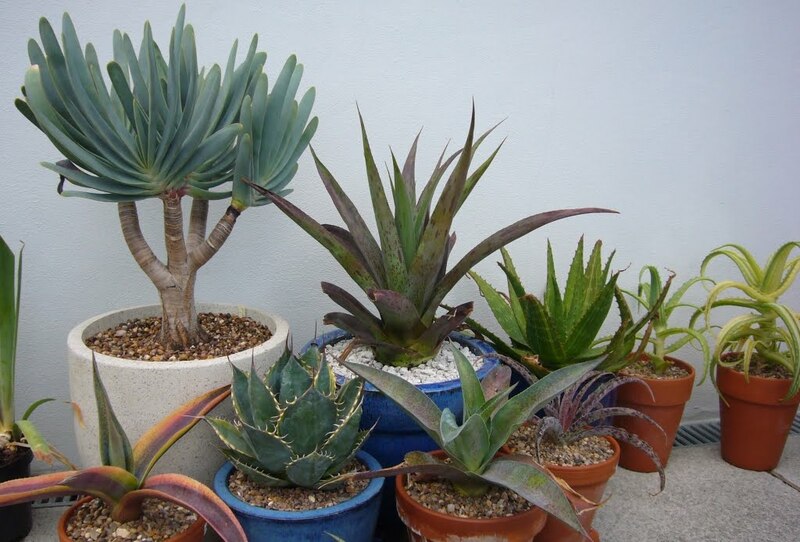 The result is that instead of using leaves, you have to grow them form offsets and few people will risk their valuable plants to top cut them to produce more. This leaves the market wanting for more; very frustrating when you're looking, but very rewarding when you do finally manage to get hold of one. It also makes for a lot of envy when other collectors turn up to see your plants. True addict "I don't have room for these.... ok one more wont hurt". Love it! Well there is always room for one more. They all of them are beautiful. Have not seen any of those here! :( Not that I need more Echeverias, but...you know. There is always room for one more. (Starting to notice a theme in my comments). Foliage color "Black River" is very original! Surprising! Yes the black and green/yellow is very different to most variegates. 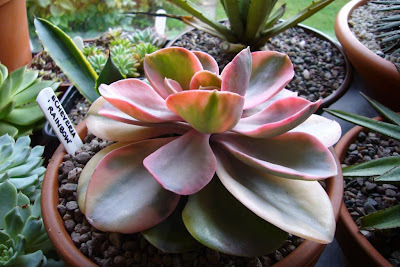 I so want an Echeveria Rainbow!!! Can't find one. Do you have any babies you are willing to sell? They are not easy to find are they. I am afraid mine hasn't offset yet, although I may be cutting it up to sort that come spring. Any chance ur rainbow has had offsets?? ?